2. Spoon the filling into a pastry bag or large zip top bag. Snip enough of the end off the bag to allow you pipe the mixture into your desired serving glasses. I alternated layers of the cookies and cream cheese mixture with chopped cookies. 3. If desired, garnish with additional whipped topping and chopped cookies. 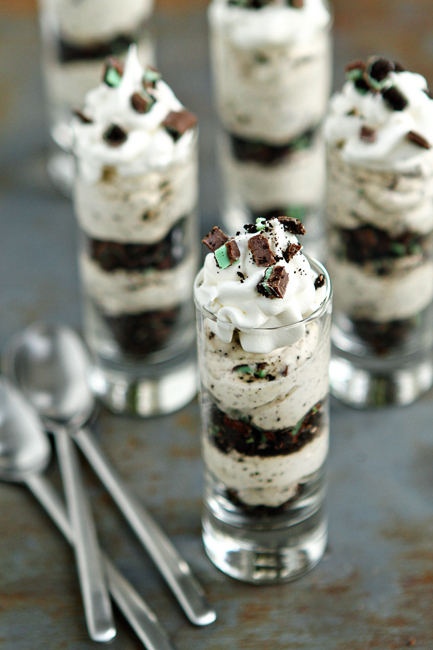 – If you cannot find the Andes Creme de Menthe Cookies, feel free to substitute Mint Oreos. – I have not attempted this recipe with a substitute for the frozen whipped topping (Cool Whip). – – Mini Cordial Glasses are from Pier 1 Imports, the spoons are from Ikea. – Using the Mini Cordial Glasses seen above will yield 8-10 servings.